Track & Trace with SAP connection. VBASE Automation Story. Article tracking with SAP connection in a roof tile factory. 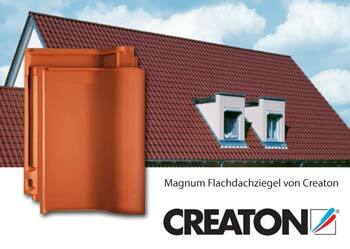 CREATON AG is one of the leading manufacturers of clay roof tiles in Germany and Europe. The products produced are natural products and are manufactured in accordance with an in-house purity law with state-of-the-art production facilities. The Autenried plant presented here produces around 7.5 million Magnum mega bricks and 28 million plain tile bricks every year. In addition, the accessory tiles belonging to these flat tiles are also manufactured here. This report looks at the production of plain tiles. The fully automatic furnace plant is supplied with dried and surface-finished bricks from three plants. Special series and all accessories for the beaver roofs are transported from the neighbouring halls to the loading stations via several conveyor belts. With the help of robots and gripper arms, the bricks are placed on refractory kiln furniture, the H-cassettes, which are then stacked on the so-called tunnel kiln cars. Depending on the product and cassette type, a kiln car has up to 1120 cassettes. After the kiln cars have been completely loaded, they automatically drive the bricks into a preheater, which serves as a buffer for production-free night and Sunday operation. In the actual 120 meter long continuous furnace you are fired at approx. 1,060° Celsius for 24 hours. After firing, the wagons are buffered on several parallel storage tracks before unloading. During the unloading process, the cassettes are first destacked and the plain tiles are placed individually, in rows, on conveyor belts. 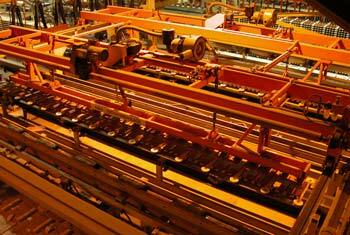 On these conveyors the bricks pass through the quality control and are counted. They are then automatically stacked and packed into mini packages. 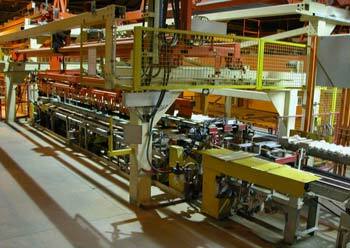 Up to 110,000 bricks are produced daily with this fully automatic process. After the furnace plant was automated 15 years ago, an SAP system was introduced as part of further rationalization measures in the area of administration. However, the SAP format for article numbers and descriptions could not be subsequently adapted to the existing system technology. Initially, "double-track" work was carried out here. This means that system-specific article numbers were used in production and SAP article numbers in administration and sales. As a result, all produced articles had to be entered again on completion and transferred manually into the SAP system. Due to the large variety of products (approx. 4000 articles) at the Autenried plant, this method of working was no longer practicable. For better tracking of a daily production, it should be possible to clearly identify the bricks on the kiln cars at any time during production. In addition, the quantities produced for an article are to be logged automatically so that they can be transferred to the SAP system later. To achieve this, each brick layer (up to 28 bricks) on the kiln car should be assigned a unique SAP and system article number during the loading process. Both article numbers should be visible during the entire firing process until discharge. To simplify operation, a table of all articles from the SAP article master should be displayed to the operator during loading. After completion of the firing process and unloading of the kiln cars, an article-related quantity determination should be carried out before and after the quality control. The article data must be formatted and made available for simple transfer to the SAP system. 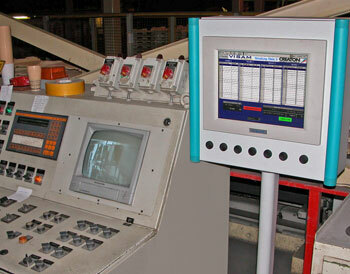 The operation of the plant was realized with two touch panel computers as operating stations at the loading and unloading facilities and a central server in the control room. The VBASE process control system is used as software for designing the user interface and managing the data. Both operator stations are connected to the server via Ethernet. The server is in turn connected via Ethernet to two PLC controls of the plant control system. The loading station consists of a touch panel PC with VBASE user interface. Here, the user selects the SAP article number from a table, based on the article master of the SAP system, for the product to be loaded. With the help of filter functions, the correct article numbers can be found quickly. As soon as a new article number is selected, another layer of bricks is written into the data structure with each cycle of the loading gripper. When the kiln car is completely loaded, the data is stored in a database on the server and is now linked to the unique kiln car number for the rest of the production process. The connection of the system controls (PLC) as well as the central article database was realized on the server. The server also transmits the data required for the loading and unloading stations, determines the quantities produced and logs all article data. In addition, the server serves as an operating station for the central product query in the control room. 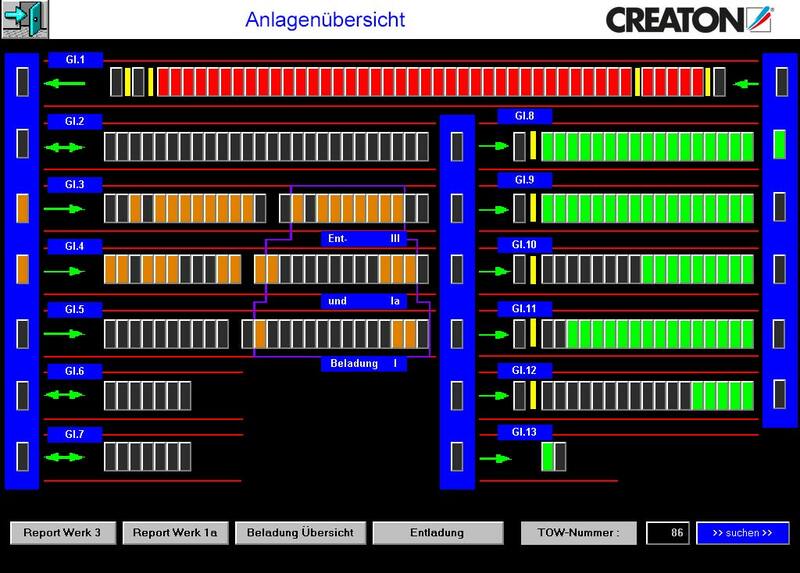 With the aid of various process diagrams, it is possible to display the kiln cars of the entire plant or in detail for individual tracks or to view the occupancy of each individual car. In an area protected by passwords, it is possible to change the assignment of the kiln cars manually if this should be necessary due to incorrect entries or plant malfunctions. You can also view all protocols here. 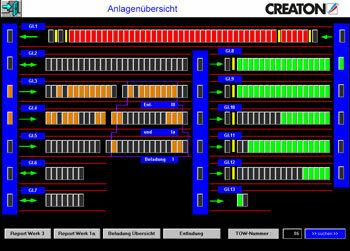 Die Entladestation ist mit dem zweiten Touch-Panel PC, der ebenfalls mit VBASE arbeitet, ausgestattet. Auf dem Bildschirm werden wahlweise die Ofenwagen der Entladegleise, sowie der momentan zu entladenden Ofenwagen visualisiert. Kommt es zu einem Produktwechsel, werden die Mengen des fertig gestellten Artikels zusammen mit den Artikelnummern und weiteren Produktionsdaten aufgezeichnet. The VBASE-based system closes the gap between the production plant and the SAP system in administration. The location and status of certain articles can be determined very quickly at any time. Production quantities are now recorded more precisely than before and the transfer of production data has been significantly simplified and thus accelerated.